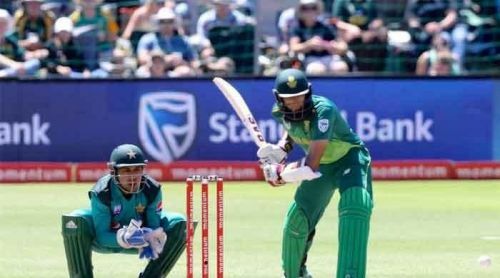 Pakistan defeated South Africa by five wickets in the first One Day International at Port Elizabeth on Saturday. It was a good performance by Pakistan who bowled well and restricted the hosts to a reasonable total. In reply, Imam-ul-Haq and Mohammad Hafeez guided Pakistan chase. Faf du Plessis won the toss and decided to bat first. It was a decent start by the South African openers as they managed 46 runs in first 10 overs. Both openers continued to milk the Pakistan bowling line up, taking singles and hitting bad balls away for boundaries. Shadab Khan struck first for Pakistan to dismiss Reeza Hendricks for 45. Amla and Reeza Hendricks added 82 runs for the opening wicket in 17.4 overs. Hashim Amla reached his half-century off 52 balls while Rassie van der Dussen struggled for timing at the start of his innings. The debutant reached his half-century off 65 balls while Amla reached his century off 113 balls. Rassie van der Dussen attacked the Pakistan bowlers and was dismissed for 93 runs off 101 balls by Hasan Ali. Pakistan bowlers gave 76 runs in the last 10 overs to restrict South Africa at 266 for 2. Chasing a target of 267 runs, Pakistan openers gave the team a decent start. Fakhar Zaman was dismissed for 25 off 23 balls. Pakistan reached 46 for 1 at end of 10 overs. After the power play, Imam and Babar Azam milked the South Africa bowlers for runs. Imam-ul-Haq reached his half-century off 59 balls while Babar Azam also looked in a good attacking mood. Reeza Hendricks broke the partnership as he dismissed Babar Azam for 49. Mohammad Hafeez made the batting look easy and added 46 runs with Imam. Imam-ul-Haq was dismissed off Oliver's bowling for 86. The experienced Hafeez reached his half-century off 49 balls. Malik and Sarfraz Ahmed were dismissed in quick succession. Hafeez and Shadab Khan added an unbeaten 44 runs for the sixth wicket to guide Pakistan home. Brief scores: Pakistan 267 for 5 in 49.1 overs (Imam-ul-Haq 86, Hafeez 71*, Oliver 2/73, Imran Tahir 1/44) beat South Africa 266 for 2 in 50 overs (Hashim Amla 108*, van der dussen 93, Hasan Ali 1/42, Shadab Khan 1/41) by 5 wickets.